Krazy Krouse Kids: Off to York We Go! Hi ho, Hi ho, it's off to York we go! Here are Chad and the kids waiting at the Mirfield train stop. It was about a 25 minute walk from our flat. Tucker enjoyed the train, too! We had a 30 minute ride to Leeds where we switched trains. It was about another 30 minutes to York. I'm not sure what river this is, but it was nice to see some water. This is in York. Another pub for Caroline! Thank goodness most places serve chicken nuggets. Tucker enjoyed the fish, but Caroline preferred the "chickens and tries and dip." Don't be fooled by the peas on her plate...she didn't even eat one! 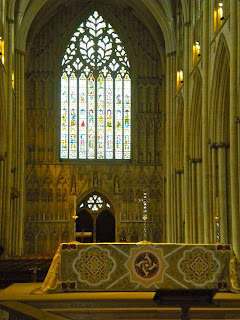 Here is York Minster. I think Chad said it was one of the largest churches in England. It was indeed very large and beautiful. Thankfully we all got in for free since Chad is a seminarian. Finally, a perk!! This is the inside of the church. The stained glass windows were amazing. They were not so colorful, but extremely detailed and large. Caroline kept saying (loudly) as we were walking through, "I don't want to go to church!" I tried and tried to explain that we were not going to a church service, just walking through. Meanwhile, Tucker was making loud noises because he liked to hear his voice echo. He smiled every time he heard the echo. It was cute. I have no idea what this is...it just looked like something I should take a picture of. Tuck and Caroline having a snack before we enter to Jorvick Museum. This is also know as the "viking museum." We expected to see vikings on ships...not so much! This was more of what we would think of as early settlers, like in Jamestown. It was a really neat museum. We rode through the museum on a pod-like thing. It was nice because we didn't have to walk. Both kids were really intrigued, so no complaints here! This was also in the museum after the ride part. Caroline was searching for artifacts. Next, we headed to a museum called "The Dig." It was an archeological museum geared for kids. Caroline was excited because she got to "dig for dinosaur bones" like at the Discovery Museum in Chattanooga. No dinosaur bones here, just pieces of pottery and skeleton bones. Tucker enjoyed this as well! 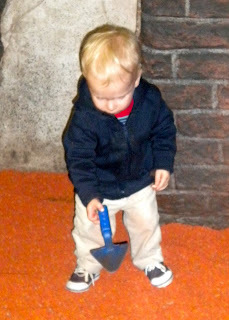 However, we had to pull him out once he hit another kid in the head with the shovel. Fortunately, no one was hurt! Yes, that is Tucker you see climbing into the bucket. He thought he would see what he could find in there. I know this is weird. Can anyone guess what this is? It is the lid on the toilet in the museum. I usually do not make it a habit to take pictures of toilets, but I had never seen this before. It had bones, pottery, shells, etc in it...very strange, but picture-worthy. This is the second part of the dig. Caroline found sea shells and cows' teeth. Here is a picture of one of the streets in York. It is a large city, yet still very quaint and manageable for newbies like us. We enjoyed it! Bye, bye train station...until next time!